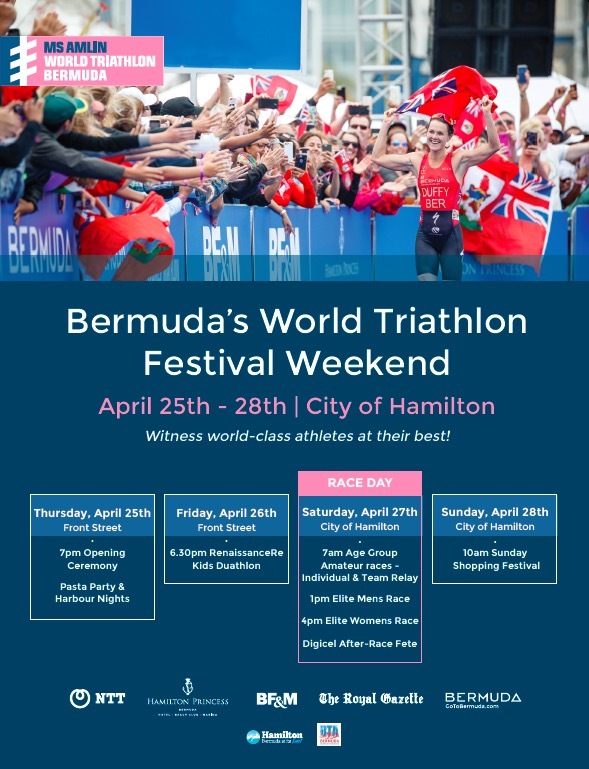 The countdown clock at the flagpole on Front Street is ticking toward Thursday April 25th, 2019 the start of the weekend of festivities of the MS Amlin World Triathlon Bermuda. Join us for a special triathlon themed Harbour Night street market, at the very heart of the event venue on Front Street. Join in the music and fun when the street comes alive in Bermudian style. Visiting athletes will enjoy local cuisine and a pre-race 'carb' meal. Be part of the warm Bermudian welcome for hundreds of visiting athletes and their friends when everyone has a good time. Friday April 26th the start line on Front Street will be filled with eager kids, aged 7 – 15, many who are new to the sport. This is a duathlon (run, bike, run), great for young starter athletes. Be in the crowd to cheer on local and visiting kids for a 6.30pm start. Registration is FREE and online at www.tribermuda.com/kids. Children will run and bike along Front Street, using part of the very same race course that the world’s top triathletes will race on the following day, including the famous blue carpet finish. Saturday April 27th is race day. Cheer loudest for Bermuda’s home sweetheart and World Champion Flora Duffy! Make your plans on where you will watch, and if you’re volunteering, thank you! As athletes are recovering and celebrating at their after-race party, spectators can join in Digicel's free After-Race Fete. Celebrate in island-style as revellers make their way along Front Street into the evening to continue into the night. When racing is done the partying takes over. Our athletes party is at the official event hotel, Hamilton Princess Hotel next to the picturesque Hamilton Harbour waterfront. The Age Group Prizegiving Awards will take place at the party. All Age Group and Elite triathletes are invited. For athletes and non-athletes Sunday April 28th is the time to shop to your heart's content. Special offers, in-store experiences and prize draws for a travel voucher and shopping spree... be in to win! Remember to find time to wind down in your own free time and visit Bermuda’s world class beaches, soak up the sun, explore our attractions and rich history and enjoy our beautiful island for a few days. You'll probably want to come back for more!